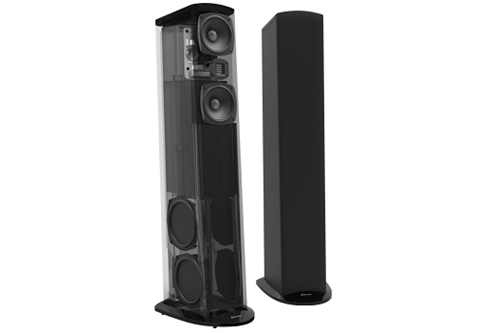 Undeniably stellar, the new Triton Reference speaker does deliver the sort of performance previously only delivered by cost no object speakers," says Dennis Burger of Home Theater Review and Ovation will be one of the first showrooms in the US to receive a pair for display (and your listening pleasure. Says Golden Ear, "The Triton Reference is an evolution of everything that we have achieved with the Triton One, but taken to a stunning new level of sonic performance and sophisticated visual design." All the components in the Reference - the active sub-bass drivers, upper-bass/midrange drivers, and high-velocity folded ribbon tweeter - are new, and have been specifically developed for use in the Reference. The fully balanced crossover is, of course, specially engineered for the Reference, and the powerful subwoofer amplifier and 56-bit DSP control unit are an evolution of those used in the Triton One and our SuperSubs.The Triton Series Towers are high-performance loudspeakers, with the top three models including a built-in powered subwoofer. Sonically, the Reference has been engineered to perform with a dramatic and authoritative voice, comparable to speakers that sell for 10 and more times its surprisingly affordable price. They completely disappear, with superb three-dimensional imaging that stretches from wall to wall and beyond, and depth that makes the wall behind them seem to vanish. The astonishing bass is rock-solid with low-frequency performance that is tight, quick, highly impactful and musical with extension flat to 20Hz and below. Another GoldenEar signature is a silky smooth high end that extends to 35 kHz with a lifelike sheen but no trace of hardness, sibilance or stridency so common with lesser tweeters. Tremendous time and energy has been put into the voicing of the speaker and the seamless blending of the drivers, for unmatched musicality with all types of music, and home theater perfection. Rarely do speakers excel at both, but with their world-class neutrality, the Reference absolutely does. A special bonus is the Reference’s extremely high 93.25 dB sensitivity, which gives them tremendous dynamic range and allows use with almost any high-quality amplifier, including many SET tube amps. All the Triton Towers are engineered for superb performance in both high quality two channel stereo systems as well as in multi-channel home theater and music systems. Their sleek, elegantly curved and tapered design is not only gorgeous but is important from a performance perspective as well.